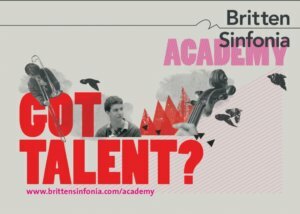 We are currently recruiting for young musicians who play specific instruments to apply to become members of Britten Sinfonia Academy for the 2018-19 season. Participants will develop their chamber music skills through a range of exciting ensemble projects and receive expert mentoring from Britten Sinfonia musicians and work alongside key guest artists from our main season. In order to fully complete your application your instrumental teacher must submit a short paragraph for you. Your application is only complete once both of these forms have been received before the deadline on Friday 18 May 2018. Should you require a pdf version of the application form, please email [email protected] and we will be happy to supply accordingly. Auditions will be held on Sunday 15th July and you must be available for this date.